Any experienced teacher will tell you that every class has a few: children who can’t focus, can’t sit still, who fight at the slightest provocation, or perhaps withdraw completely. These kids are usually labeled as “bad”, “out of control” or “willful”. But brain research has shown that these kids aren’t intentionally bad. Their brains are shorting out from an overload of toxic stress. Prompted by results from a large study of Spokane, WA, schoolchildren that showed how childhood trauma is taking more of a toll than many imagined, an innovative project is underway that will test three types of intervention in 900 families that participate in Spokane’s Head Start program. or other drugs, neglect, or mental illness in a family – but it’s also the main reason that children missed school or got into trouble. It’s the second-highest predictor of academic failure, after a child being in special education classes. And the more stressors a kid had, the study showed, the more likely that child was to have failing grades, poor attendance, severe behavior problems and poor health. “The 248 kids with three or more adverse childhood experiences had three times the rate of academic failure, five times the rate of severe attendance problems, six times the rate of school behavior problems, and four times the rate of poor health compared with children with no known trauma,” says Christopher Blodgett, director of the Child and Family Research Unit (formerly the Area Health Education Center of Eastern Washington) at Washington State University. neurobiological research – including studies by Dr. Martin Teicher, director of the Developmental Biopsychiatry Research Program at McLean Hospital; Dr. Bruce McEwen, director of the Harold and Margaret Milliken Hatch Laboratory of Neuroendocrinology at Rockefeller University; and Dr. Jack Shonkoff, director of the Center on the Developing Child at Harvard University – that showed how toxic stress damaged the developing brains of children. Researchers found a direct link between childhood trauma and adult onset of chronic disease, such as diabetes, heart disease, and some types of cancer. They also found that people with a higher ACE Score – three or more types of childhood trauma – had a significantly higher risk of chronic disease, suicide, drug use, engaging in violence or being a victim of violence. The 17,000 people who participated in the study were 75 percent white, middle to upper-middle class, 76 percent had attended or graduated from college, and, since they were members of Kaiser through their employers, they had jobs and great health care. In the last three years, 18 states have done their own ACE Studies, and those who have finished the analysis have found similar results. The link between childhood trauma and adult onset of chronic disease was the damage that the toxic stress of chronic and severe trauma inflicts on a child’s developing brain. It essentially stunts the growth of some parts of the brain, and results in fried circuits in others. Children with toxic stress live their lives in fight, flight or fright mode – unable to concentrate to learn, responding to the world as a place of constant danger, not trusting adults and unable to develop healthy relationships with peers. Failure, despair, blame, shame and frustration follow, and children transition into adulthood finding comfort by overindulging in food, alcohol, tobacco (nicotine is an anti-depressant), drugs (methamphetamines are anti-depressants), work, high-risk sports, a plethora of sexual partners….anything to pump up feel-good moments to escape bad memories and feelings. This knowledge “started pushing us toward thinking about how we end up getting to the systems that universally serve children and families and how we can potentially bend the curve on risk and consequences of exposure to trauma,” says Blodgett. So, in the spring of 2010, he and five other researchers obtained some funding from the Spokane County Community Network and the Washington State Family Policy Council. They worked with teachers and administrators to randomly choose 2,100 children from kindergarten through sixth grade in 10 elementary schools. They had asked school staff to identify the traumatic events that they knew the children had been exposed to without having to ask the children. The list included divorced or separated parents, homelessness or a risk of homelessness, witnessing family violence, having been involved with child protective services, a jailed family member, a family member abusing alcohol or other drugs, neglect, mental illness in a family member, exposure to community violence, or death of a parent or caregiver. 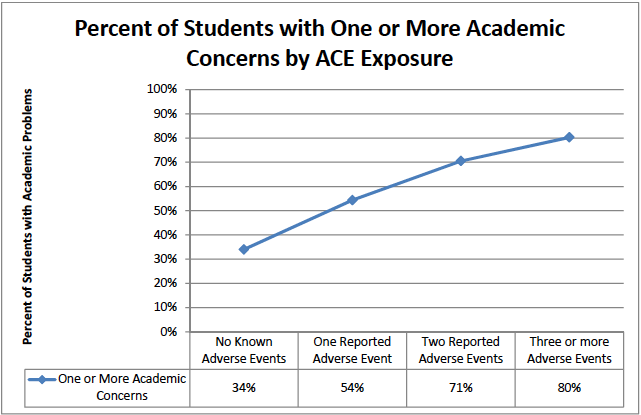 He hopes the data is helping educators understand that, with one in three or four children exposed to significant adverse childhood experiences, trauma may be impacting their ability to teach children. One intervention will train Head Start teachers to work with traumatized children. A second intervention will train teachers and educate parents about parenting skills and how their own childhood trauma has affected their lives. A third will train teachers and focuses on parent-child attachment skills, without delving into trauma history. This project, which began last Fall, is in the process of recruiting families. Blodgett has high hopes for how this knowledge of ACEs and the toxic effects of stress on developing children’s brains can change how educational systems handle traumatized children. This sounds like an extraordinarily good study. The state of Washington seems to be ahead of most when it comes to serving the needs of children and families. I completely agree with Mr. Blodgett’s closing statements. Can we help these concepts catch fire in Northern California and beyond? Can we begin with pregnant couples? Hi Barbara, We are working with our local health care providers to include information on this in classes for Lamaze, breastfeeding, and materials for parents leaving the hospital. We also are hoping to create information that goes to every family receiving a Home Visit. Jane Stevens mentioned you to me when she and I spoke yesterday, and she encouraged me to contact you about your work. Can we visit by phone? Your work sounds really important. Let’s talk. I can be reached at 916 342-2494 and am available frequently during the day.